Mon - Fri, 10am-6pm. Saturday, 11am-5pm. 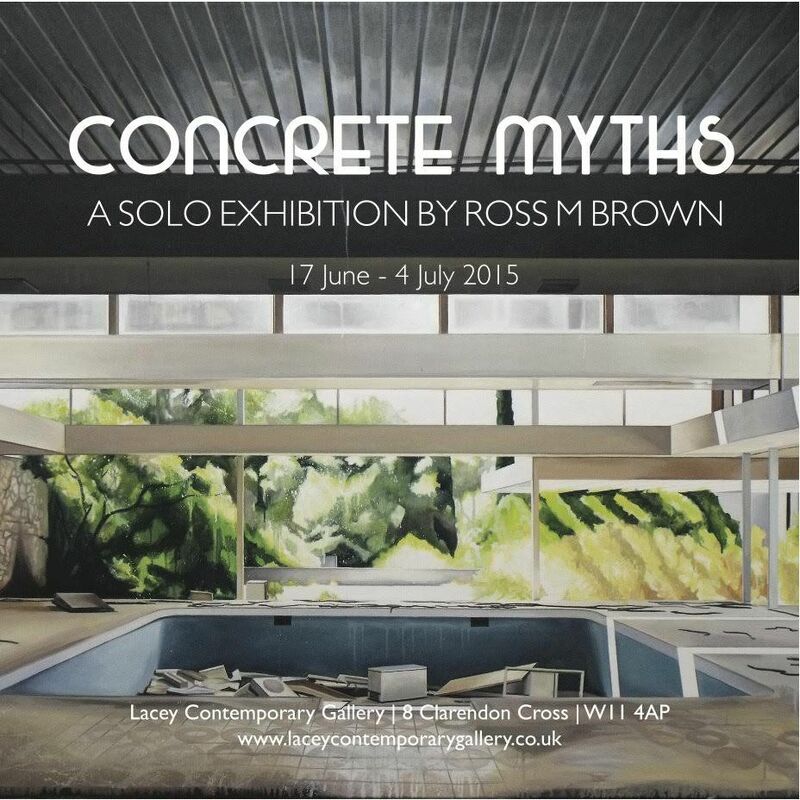 Lacey Contemporary Gallery is proud to present CONCRETE MYTHS, a Solo exhibition by Edinburgh based artist, Ross M Brown, this June. Ross M Brown’s work channels the experience of architectural space through the medium and history of painting. Exploring subject matter found within abandoned Modernist architecture, the artist layers disparate approaches from the history of painting producing a palimpsest of diverging and converging painterly approaches. 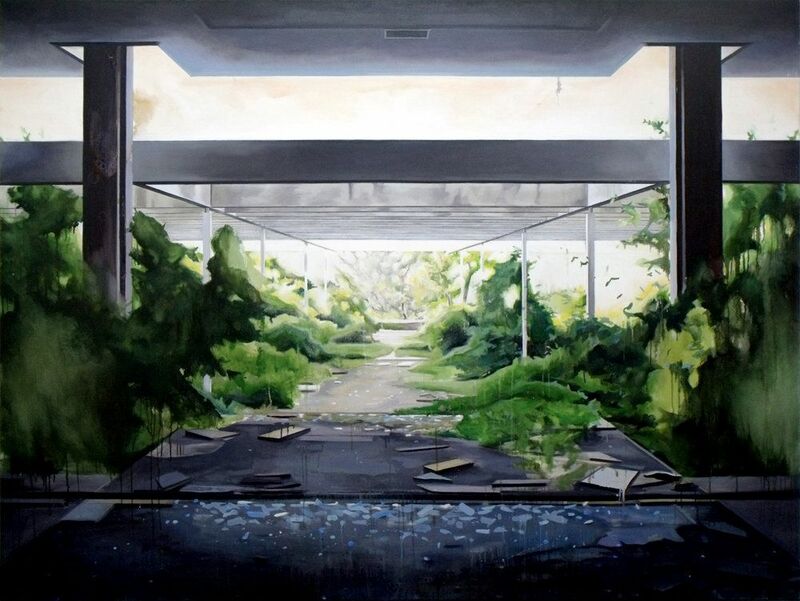 Relating to the urban ruin as a hybrid space where divisions between past and present, architecture and nature, order and disorder have become blurred and indistinct, Brown employs a painting process which pits rigidly constructed perspective against the fluid materiality of poured, smeared and dripped paint. 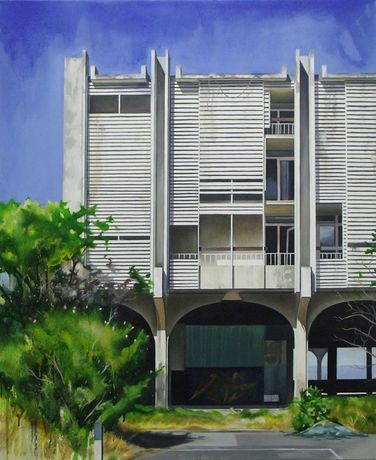 The body of work presented at “Concrete Myths” was created following a research trip to the derelict Haludovo Palace Hotel on Krk Island, a 1970’s luxury resort designed by Modernist architect Boris Magas. Brown depicts the dilapidated location in a series of large scale paintings that often reference formal tropes more commonly associated with Modernist abstraction; flat vertical or horizontal bands of colour reminiscing geometric abstraction, thinned down transparent stains and drips from colour-field and action painting, areas of textured impasto which punctuate the materiality of the surface. Conversely, these abstract formal devices and processes are used to representational ends, inviting the viewer into an ambiguous space that wavers between the materiality of paint and the illusionistic image. 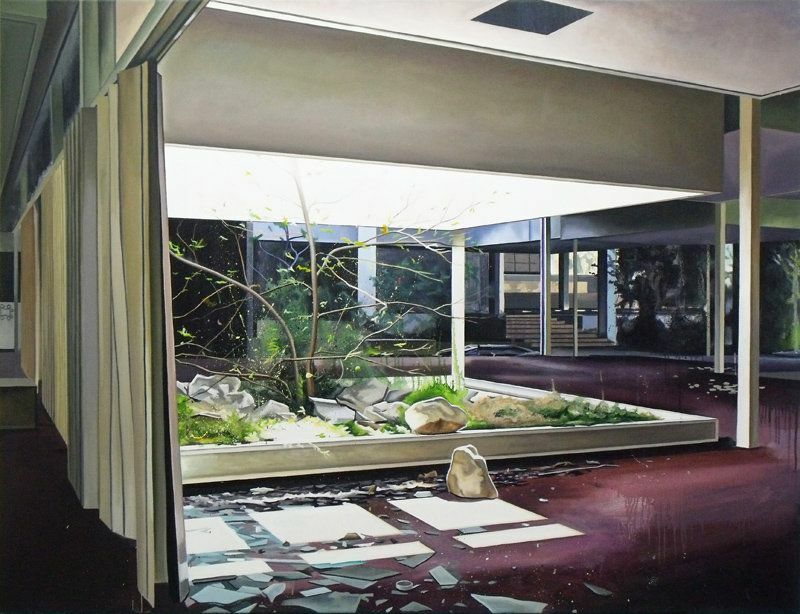 Ross M Brown was born in 1986 and currently lives and works in Edinburgh. He studied on the BA(Hons) Fine Art and Master of Fine Art course at Duncan of Jordanstone College of Art in Dundee, graduating in 2010. Previous exhibitions include Demimonde curated by Slate Projects, The Marginsat EB&Flow Gallery and House of the Nobleman in conjunction with the Saatchi Gallery. 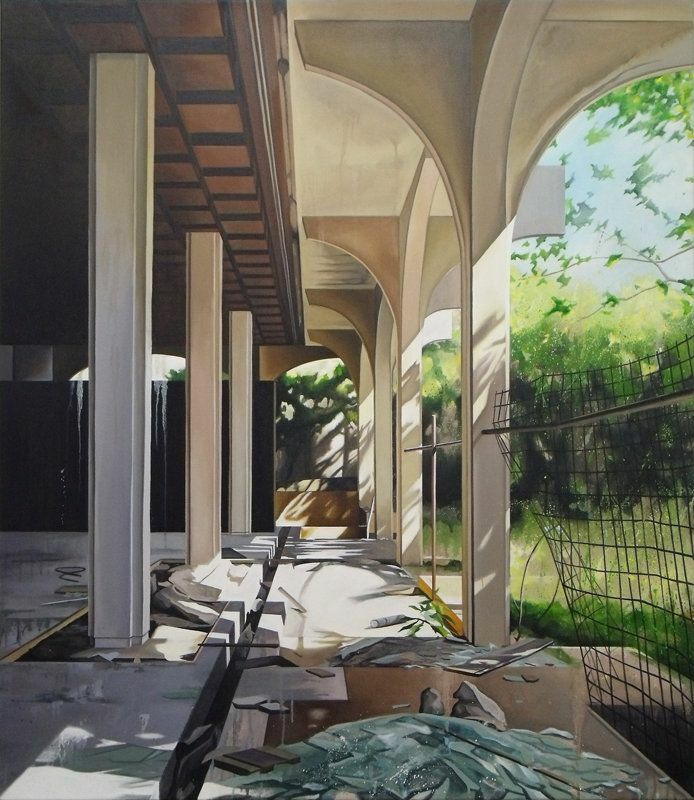 Ross’ work has been nominated for prizes including the Griffin Art Prize in 2012, Saatchi New Sensations in 2010 and he received the NS Macfarlane Trust award at the Royal Scottish Academy in 2010. His work was featured in the book The Catlin Guide 2011: New Artists in the UK. 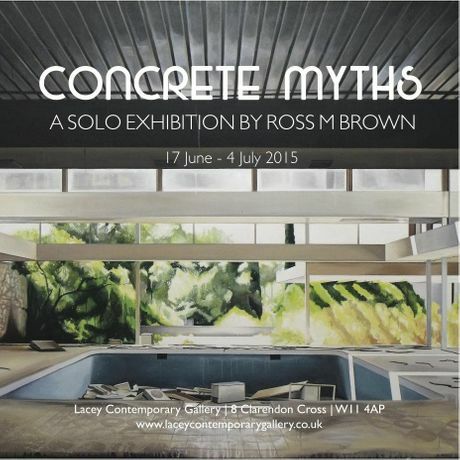 “Concrete Myths” was supported by Creative Scotland and the Dewar Arts Award.